For $66 billion Silicon Valley juggernaut Uber, car rides were only the beginning. 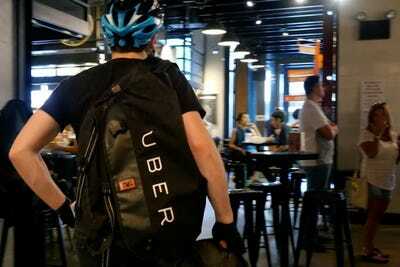 Uber has been quietly expanding its business, getting into food delivery and, more recently, delivery logistics. The big idea is that if anything or anyone needs to go anywhere — Uber will deliver. Today, that plan takes a big step forward with the expansion of the UberRUSH package delivery service so that any business, of any size, anywhere, can have their app automatically call a courier and have their product delivered. It’s the Uber-ification of, well, everything. That might sound a little abstract. So here’s a real-world and very delicious example that shows off the potential of this program. 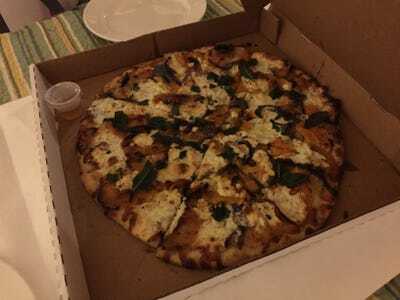 Pythagoras Pizza (formerly Easy as Pi), a small San Francisco-based pizza-on-demand app startup, has been an early customer of the expanded UberRUSH for the past few months — and now, Uber couriers are making 50% of its pizza deliveries, enabling a 20% increase in overall delivery volume, says Pythagoras founder Evan Kuo. It’s a big turnaround from the days of Pythagoras’ launch in the fall of 2015, when the founders very purposely kept their business on the downlow. Still new, they sometimes had to turn business away because they simply couldn’t handle it. “We were afraid to tell people about our business because of volume,” says Kuo. Oh, and for the record: Pythagoras’ pizza is pretty good, too. Pythagoras, a very early venture-backed company with investors like Flickr cofounder Caterina Fake and Zynga cofounder Justin Waldron, has to pick its battles. 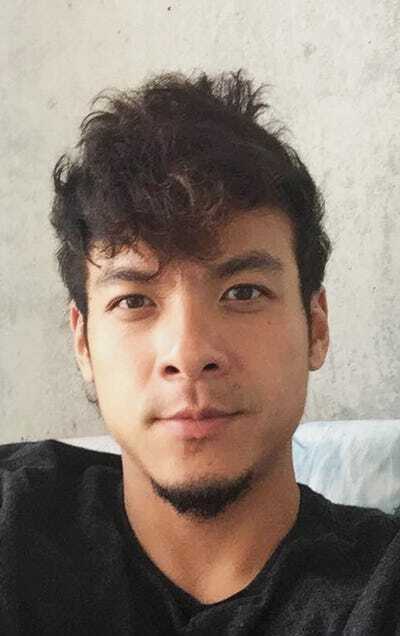 Kuo, a software engineer by training, says he spent 6 months ahead of launch developing a perfect pizza crust optimised for the 10-15 minutes it takes to deliver a pizza on demand. But his teammates are chefs and coders, not logistics experts, and they can only deliver so many pizzas. Matt Weinberger/Business InsiderMy delicious pizza from Pythagoras, circa December 2015. Kuo likens Pythagoras’ more limited availability to running a hip new brunch restaurant that always has a line: “Kinda cool, gets old.” The company is very close to profitability on its $20-per-pizza model, Kuo says, but it needs to keep on making deliveries to get there. And while a line might make you look cool to outsiders, it’s money you’re not making. So by usingUberRUSH, Pythagoras doesn’t have to hire as many dedicated delivery people, which cuts down on overhead. 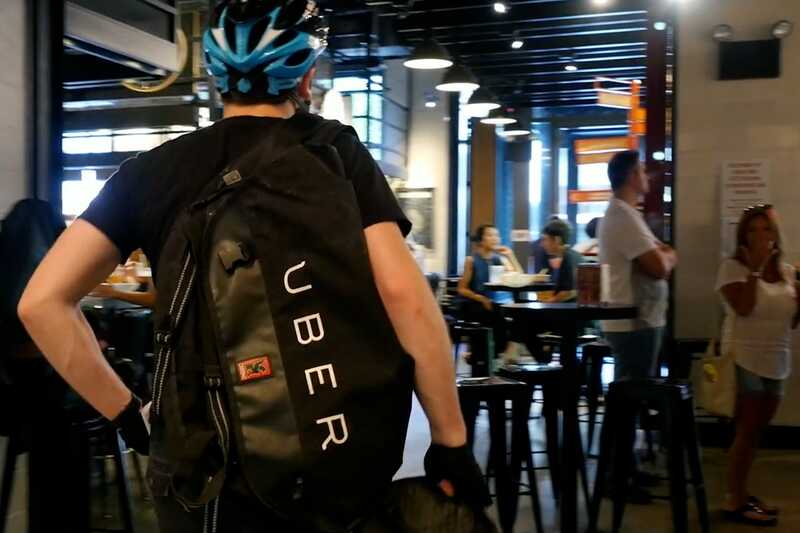 During a sales spike, like a Golden State Warriors game, they just start outsourcing deliveries to Uber couriers so they can keep up with demand, Kuo says. Adopting UberRUSH for delivery overflow doesn’t totally solve the volume problem, Kuo says, since they still have to make the pizzas. But given that Pythagoras takes the pizza orders from its app, makes the pizza, and handles delivery, having Uber as an overflow option reduces a lot of pressure. “When you’re running a vertically-integrated company, it can feel like you’re holding up the roof with your bare hands,” Kuo says. UberAn UberRUSH courier in New York City. Kuo says that he’s considering replacing deliveries entirely with UberRUSH couriers, but for now he’s keeping them as a fallback option. With the high-profile flameouts of other on-demand startups like SpoonRocket and Shuddle, Kuo wants to focus on keeping Pythagoras’ spending under control and achieving profitability, and Uber is a tool to that end. For Uber itself, this is a sign of where they want to take the business. UberRUSH is helping Pythagoras grow, and it’s making money for the mothership in the process. Now, with the opening of the UberRUSH program to every single developer, pretty much anything can get delivered, just like a pizza.